The address that I am about to give is not the one I had imagined. After the lovely contemplative tone of last summer’s assembly, I had anticipated simply articulating from our contemporary religious life reflections some of the new things we sense that God has been doing. Well, indeed we have been sensing new things. The doctrinal assessment, however, is not what I had in mind! Clearly, there has been a shift! Some larger movement in the Church, in the world, has landed on LCWR. We are in a time of crisis and that is a very hopeful place to be. As our main speaker, Barbara Marx Hubbard, has indicated, crisis precedes transformation. It would seem that an ecclesial and even cosmic transformation is trying to break through. In the doctrinal assessment we’ve been given an opportunity to help move it. We weren’t looking for this contoversy. Yet I don’t think that it is by accident that it found us. No, there is just too much synchronicity in events that have prepared us for it. The apostolic visitation galvanized the solidarity among us. Our contemplative group reflection has been ripenening our spiritual depth. The 50th anniversary of the Vatican II approaches. How significant for us who took it so to heart and have been so shaped by it! It makes us recognize with poignant clarity what a very different moment this is. I find my prayer these days often taking the form of lamentation. Yes, something has shifted! And now, here we are, in the eye of an ecclesial storm, with a spotlight shining on us and a microphone placed at our mouths. What invitation, what opportunity, what responsibility is ours in this? Our LCWR mission statement reminds us that our time is holy, our leadership is gift, and our challenges are blessings. I think It would be a mistake to make too much of the docrinal assessment. We cannot allow it to consume an inordinate amount of our time and energy or to distract us from our mission. It is not the first time that a form of religious life has collided with the institutional Church. Nor will it be the last. We’ve seen an apostolic visitation, the Quinn Commission, a Vatican intervention of CLAR and of the Jesuits. Many of the foundresses and founders of our congregations struggled long for canonical approval of our institutes. Some were even silenced or ex-communicated. A few of them, as in the cases of Mary Ward and Mary McKillop, were later canonized. There is an inherent existential tension between the complementary roles of hierarchy and religious which is not likely to change. In an ideal ecclesial world, the different roles are held in creative tension, with mutual respect and appreciation, in an enviroment of open dialogue, for the building up of the whole Church. The doctrinal assessment suggests that we are not currently living in an ideal ecclesial world. I also think it would be a mistake to make too little of the doctrinal assessment. The historical impact of this moment is clear to all of us. It is reflected in the care with which LCWR members have both responded and not responded, in an effort to speak with one voice. We have heard it in more private conversations with concerned priests and bishops. It is evident in the immense groundswell of support from our brother religious and from the laity. Clearly they share our concern at the intolerance of dissent even from those with informed consciences, the continued curtailing of the role of women. Here are selections from one of the many letters I have received: “I am writing to you because I am watching at this pivotal moment in our planet’s spiritual history. I believe that all the Catholic faithful must be enlisted in your efforts, and that this crisis be treated as the 21st century catalyst for open debate and a rush of fresh air through every stained glass window in the land.” Yes, much is at stake. Through it all, we can only go forward with truthfulness and integrity. Hopefully we can do so in a way that contributes to the good of religious life everywhere and to the healing of the fractured Church we so love. It is no simple thing. We walk a fine line. Gratefully, we walk it together. ”The human heart can go the length of God. The frozen misery of centuries cracks, breaks, begins to move. The thunder is the thunder of the floes. I would like to suggest a few ways for us to navigate the large and small changes we are undergoing. God is calling to us from the future. I believe we are being readied for a fresh inbreaking of the Reign of God. What can prepare us for that? Perhaps there are answers within our own spiritual DNA. Tools that have served us through centuries of religious life are, I believe, still a compass to guide us now. Let us consider a few, one by one. 1.How can we navigate the shifts? Through contemplation. Here is one image of contemplation: 1 the prairie. The roots of prairie grass are extraordinarily deep. Prairie grass acutally enriches the land. It produced the fertile soil of the Great Plains. The deep roots aerate the soil and decompose into rich, productive earth. Interestingly, a healthy prairie needs to be burned regularly. 2 It needs the heat of the fire and the clearing away of the grass itself to bring the nutrients from the deep roots to the surface, supporting new growth. This burning reminds me of a similar image. There is a kind of Eucalyptus tree in Australia whose seeds cannot germinate without a forest fire. The intense heat cracks open the seed and allows it to grow. Perhaps with us, too, there are deep parts of ourselves activated only when more shallow layers are stripped away. We are pruned and purified in the dark night. In both contemplation and conflict we are mulched into fertility. As the burning of the prairie draws energy from the roots upward and outward, contemplation draws us toward fruitful action. It is the seedbed of a prophetic life. Through it, God shapes and strengthens us for what is needed now. The vocation of religious life is prophetic and charismatic by nature, offering an alternate lifestyle to that of the dominant culture. The call of Vatican II, which we so conscientiously heeded, urged us to respond to the signs of our times. For fifty years women religious in the United States have been trying to do so, to be a prophetic voice. There is no guarantee, however, that simply by virtue of our vocation we can be prophetic. Prophecy is both God’s gift as well as the product of rigorous asceticism. Our rootedness in God needs to be deep enough and our read on reality clear enough for us to be a voice of conscience. It is usually easy to recognize the prophetic voice when it is authentic. It has the freshness and freedom of the Gospel: open, and favoring the disenfranchised. The prophetic voice dares the truth. We can often hear in it a questioning of established power, and an uncovering of human pain and unmet need. It challenges structures that exclude some and benefit others. The prophetic voice urges action and a choice for change. 3.How can we navigate the shifts? Through solidarity with the marginalized. We cannot live prophetically without proximity to those who are vulnerable and marginalized. First of all, that is where we belong. Our mission is to give ourselves away in love, particularly to those in greatest need. This is who we are as women religious. But also, the vantage point of marginal people is a privileged place of encounter with God, whose preference is always for the outcast. There is important wisdom to be gleaned from those on the margins. Vulnerable human beings put us more in touch with the truth of our limited and messy human condition, marked as it is by fragility, incompleteness, and inevitable struggle. The experience of God from that place is one of absolutely gratuitous mercy and empowering love. People on the margins who are less able to and less invested in keeping up appearances, often have an uncanny ability to name things as they are. Standing with them can help situate us in the truth and helps keep us honest. We need to see what they see in order to be prophetic voices for our world and Church, even as we struggle to balance our life on the periphery with fidelity to the center. Religious have navigated many shifts over the years because we’ve done it together. We find such strength in each other! 7 In the last fifty years since Vatican II our way of living community has shifted dramatically. It has not been easy and continues to evolve, within the particular US challenge of creating community in an individualistic culture. Nonetheless, we have learned invaluable lessons. We who are in positions of leadership are constantly challenged to honor a wide spectrum of opinions. We have learned a lot about creating community from diversity, and about celebrating differences. We have come to trust divergent opinions as powerful pathways to greater clarity. Our commitment to community compels us to do that, as together we seek the common good. We have effectively moved from a hierarchically structured lifestyle in our congregations to a more horizontal model. It is quite amazing, considering the rigidity from which we evolved. The participative structures and collaborative leadership models we have developed have been empowering, lifegiving. These models may very well be the gift we now bring to the Church and the world. The breaking down and breaking through of massive paradigm shift is a violent sort of process. It invites the inner strength of a non-violent response. Jesus is our model in this. His radical inclusivity incited serious consequences. He was violently rejected as a threat to the established order. Yet he defined no one as enemy and loved those who persecuted him. Even in the apparent defeat of crucifixion, Jesus was no victim. He stood before Pilate declaring his power to lay down his life, not to have it taken from him. What, then, does non-violence look like for us? It is certainly not the passivity of the victim. It entails resisting rather than colluding with abusive power. It does mean, however, accepting suffering rather than passing it on. It refuses to shame, blame, threaten or demonize. In fact, non-violence requires that we befriend our own darkness and brokeness rather than projecting it onto another. This, in turn, connects us with our fundamental oneness with each other, even in conflict. Non-violence is creative. It refuses to accept ultimatums and dead-end definitions without imaginative attempts to reframe them. When needed, I trust we will name and resist harmful behavior, without retaliation. We can absorb a certain degree of negativity without drama or fanfare, choosing not to escalate or lash out in return. My hope is that at least some measure of violence can stop with us. Joyful hope is the hallmark of genuine discipleship. We look forward to a future full of hope, in the face of all evidence to the contrary. Hope makes us attentive to signs of the inbreaking of the Reign of God. Jesus describes that coming reign in the parable of the mustard seed. Let us consider for a moment what we know about mustard. Though it can also be cultivated, mustard is an invasive plant, essentially a weed. 12 The image you see is a variety of mustard that grows in the Midwest. Some exegetes tell us that when Jesus talks about the tiny mustard seed growing into a tree so large that the birds of the air come and build their nest in it, he is probably joking. 13 To imagine birds building nests in the floppy little mustard plant is laughable. It is likely that Jesus’ real meaning is something like Look, don’t imagine that in following me you’re going to look like some lofty tree. Don’t expect to be Cedars of Lebanon or anything that looks like a large and respectable empire. But even the floppy little mustard plant can support life. Mustard, more often than not, is a weed. 14 Granted, it’s a beautiful and medicinal weed. Mustard is flavorful and has wonderful healing properties. 15 It can be harvested for healing, and its greatest value is in that. But mustard is usually a weed. 16 It crops up anywhere, without permission. And most notably of all, it is uncontainable. It spreads prolifically and can take over whole fields of cultivated crops. 17 You could even say that this little nuisance of a weed was illegal in the time of Jesus. There were laws about where to plant it in an effort to keep it under control. Judy Cannato, Field of Compassion: How the New Cosmology is Transforming Spiritual Life. Notre Dame, IN: Sorin Books, 2010. Barbara Marx Hubbard, Conscious Evolution: Awakening the Power of Our Social Potential. Novato, CA: New World Library, 1998. Joanna Macy and Chris Johnstone, How to Face the Mess We’re in Without Going Crazy. Novato, CA: New World Library, 2012. Jan Richardson, Night Visions: Searching the Shadows of Advent and Christmas. Wanton Gospeller Press, 2010. Margaret Silf, The Other Side of Chaos: Breaking Through When Life is Breaking Down. Chicago: Loyola Press, 2011. Alice Walker, Hard Times Require Furious Dancing. Novato, CA: New World Library, 2010. 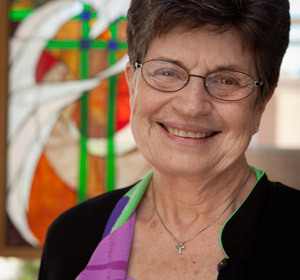 The Leadership Conference of Women Religious (LCWR) is an association of the leaders of congregations of Catholic women religious in the United States. The conference has more than 1500 members, who represent more than 80 percent of the 57,000 women religious in the United States. Founded in 1956, the conference assists its members to collaboratively carry out their service of leadership to further the mission of the Gospel in today’s world.